FANBOY PLANET.com . : new-line-vertigo :. Just as DC did in publishing in the '90s, Warner Brothers has determined that their darker, edgier characters from comics will be kept separate from the main Warner Brothers label. Beginning with Neil Gaiman's The Sandman, the "Vertigo" characters will all be produced under the New Line Cinema banner. This means that Joseph Gordon-Levitt's adaptation of the classic series may have more room to push the envelope, and in the average moviegoer's mind, stand separately from the main DC Universe being built (Warner hopes) in theaters. Maybe that will be more reflective of the comics, but it's hard to call them darker when it keeps looking like the DC movies themselves are so grim and gritty. The Vertigo imprint has been reflected on the big screen through Warner Brothers before. The Keanu Reeves version of Constantine started with the Vertigo logo. (The NBC television series bore the DC Comics logo.) As source material, Vertigo books tend to be more creator-driven, exploring ideas that might not open wide in 6,000 theaters and win the box office. Except that this isn't a perfect separation, and in Warner Brothers' constant unsure sureness of what they're doing, may turn out to be a non-story. New Line Cinema will continue developing Shazam! 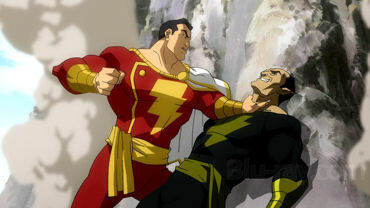 with Dwayne Johnson, which could (and should) be a brighter, more light-hearted film, as decades worth of stories are essentially magical wish-fulfillment superhero stuff -- very family friendly -- though Johnson's Black Adam is definitely a tortured anti-hero. And The Hollywood Reporter, which first broke this news, points out that Dark Universe, featuring a few Vertigo characters like John Constantine and Swamp Thing alongside Deadman, Zatanna, and The Spectre, will still be under the Warner banner. Granted, Constantine and Swamp Thing started out as DC characters, but that was before the Vertigo imprint was created. And yes, they ended up back in the mainstream DC Universe as part of The New 52. Worse, The Hollywood Reporter mentions off-handedly that Guillermo Del Toro is off that project. We know that he completed a screenplay, at least, but if it moves forward, someone else as yet unnamed will direct it. We shouldn't be surprised. One wing of the Library in The Dreaming is a screening room that continuously shows Del Toro movies that have been announced but were never made. His Tarzan is fantastic. So outside of The Sandman, which does have the potential of being a few films, though may not be, what Vertigo titles would be adapted to film? Television is really the place for Vertigo. 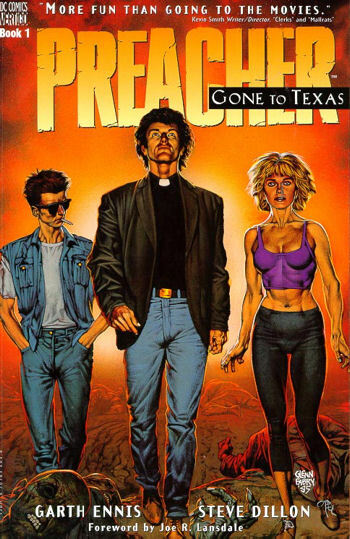 Already we have iZombie on The CW (though it's far from the source material), will get Lucifer on Fox for Fall 2015, and Seth Rogen and Evan Goldberg are shooting Preacher for AMC to turn into a series in 2016. What's left? Lately, Vertigo has been the place for some intriguing horror and science fiction, and if New Line wants to just make good original ideas without thinking of long-range franchise, there might be some potential. In their back catalog, 100 Bullets would be great, but also seems more fittting for AMC or HBO. I have just convinced myself on American Vampire, perhaps, but we'll see. Outside of The Sandman, nobody has heard a thing. It still seems largely cosmetic. If Warner Brothers isn't worried about people confusing their successful television superheros with their cinema superheroes, why would they worry if a couple get identified as having a kink or two? Let us know what you think, via email, Facebook, or Twitter @FanboyPlanet.